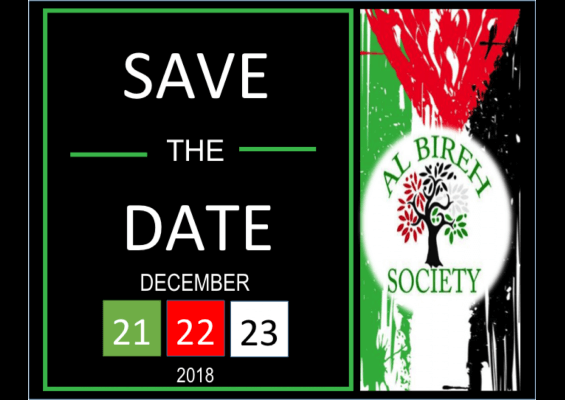 The Al Bireh Society will host it’s annual convention in Orlando, Florida at the Omni Hotel Dec. 21 through 23, 2018. Visit the Al Bireh Society website by clicking here. The Al Bireh Society is a non-profit charitable educational American Palestinian organization whose proud members derive their ancestry from the original family from the city of Al bBireh, Palestine. Our objective is to serve our membership and the Palestinian, Arab, non-Arab, and charitable communities in the United States and abroad. Our mission is to perpetuate the Al Bireh family by means of providing educational, humanitarian, financial, charitable and cultural programs as well as social interaction, and to enhance and promote the interaction of its members to the Arabic culture and to promote our culture and heritage to those outside our community, to the American public at large, and to the descendants of Al Bireh living throughout the world. Our mission is to be accomplished as provided for within the By-Laws. The Al Bireh Society has two major chapters, one in Washington D.C., and the other in Orlando, Florida. Al Bireh is a Palestinian village located near Ramallah, Palestine. DC Chapter The Washington DC Chapter of the Al Bireh Society. We have a strong group including members who hosted the 2013 Al Bireh Convention. Located in the nations capital, we are always happy to welcome new members! Florida Chapter The Florida chapter members hosted the 2014 Al Bireh Convention, and are always excited to meet new members. THIS POST HAS BEEN READ 231558 TIMES SO FAR. THANK YOU!